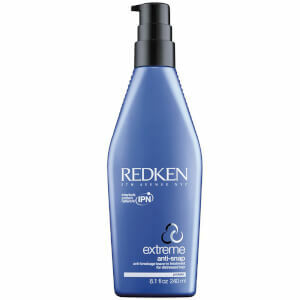 Instantly replenish your hair's moisture levels with Redken Extreme CAT Protein Treatment. Redken's patented taurine technology and cationic proteins help reconstruct and fortify your damaged hair leaving you with soft, silky locks. The Extreme CAT Protein Treatment is specially formulated to provide a triple line of defence; proteins penetrate deep into the core of your hair helping build internal strength; ceramide enters the cuticle layers to reinforce the structure and help repair any damaged areas; and natural lipids, like those found naturally in your hair help to resurface your hair leaving the cuticles shiny, smooth and protected. After shampooing, squeeze excess water from your hair. Apply CAT Treatment and lather. Leave on for 3-5 minutes and rinse. Can not live without Redken Extreme Cat Treatment. It has become a part of my hair routine, because my hair is so damaged. It has helped my hair so much! Highly recommend.